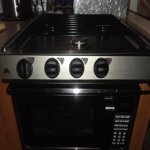 Hamilton Beach 0.9 cu.ft. Microwave Oven, Stainless Steel:0.9 cu ftStainless steel design900W power/10 power levelsTouch pad controlConvenience cooking controls6 auto cooking menusTime and weight defrostLED display, kitchen timerCooking complete reminderDoor with handleChild safety lockDimensions: 19.02 in W x 15.6 in D x 11.06 in H1 year limited warranty Sharp design in stainless steel, this microwave oven fits your modern kitchen and offers a variety of menu choices to complete your cooking tastes and style. 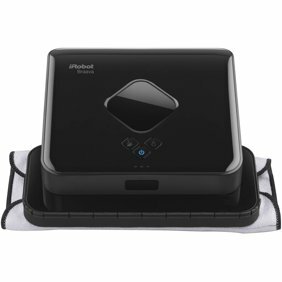 It has an output of 900 watts and includes 10 power levels. The LED display is simple to read, and the touch-pad makes it easy to control. 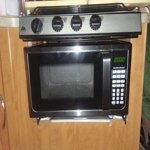 This 900 watt microwave oven includes a lockout feature for child safety, as well as a timer and clock feature. It allows you to cook potatoes, popcorn, reheat frozen dinners, pizza or beverages with just one touch. It's designed to give you even heating for consistent results that you can feel good about feeding to your family. What a bargain. I was looking for the largest microwave that would fit into a space in my motorhome kitchen. I removed the RV propane oven and placed this in the old cavity. 19 inch wide microwave in a 21 inch slot is a pretty good fit. 900W is good for me. I must get by with 120VAC and 30Amps. This pulls only 1/4 of that load capacity. My space heater takes 1/3; my convection oven/air fryer takes 1/2; and my air conditioner takes 2/3. Get the picture? It's not a full size microwave, but it's close enough for me. It's 50% larger in oven space than the small ones kids go off to college with today. The kicker is this is as cheap or less expensive than these tiny models. This is as full functioned as I needed. It covered my wish list of: *Popcorn button. *+30 Second button. *One touch timing for 1 thru 6 full minutes. *Kitchen clock. *Kitchen timer. *Lighted cooking cavity. *Adjustable power level. The rest of my kitchen appliances are stainless. This blends in well. Compared to kitchen appliances I've been buying lately, this has a long power cord. The control panel is not back lit. Not a game breaker for me, but if installed in a poorly lighted area, it will be hard to read the buttons. The fit between the glass turntable and it's power drive cog is excellent. With my last microwave it wanted to ride off. The turntable diameter is 10", the same size as my dinner plates. I found this microwave to be heavy for it's size. Not a problem, just noticeable. I'll be generous and call that well built. I looked at a lot of microwaves before making my purchase. The less expensive ones I ran across were 0.6 cubic foot unit and they run only about $5 less with fewer finish options. Unless you have a need for a smaller unit, I'd go with this. If you're considering a 1.0 to 1.2 cubic foot model, I suggest you look at the price of this and consider if the extra $$$ is worth that small amount of increased capacity. I am highly pleased with the purchase. We had a 1000wat microwave which gave way and we had to replace it. It was in a cabinet built specifically for it's dimensions and it was small. So we looked to replace it with something that would fit in the space and this fit perfectly. Although 100 watts less in power it seems to cook just as quickly. It has a nice finish and simple to open and close. Some reviews had complained about the finish alarm not stopping but it rings and if you don't get it in a couple minutes, it rings again, and will continue to remind you every couple minutes. I find it helpful so if I had stepped outside or on another project and had forgot was re-heating a cup of coffee, it reminded me when I returned. Very convenient to use. Highly recommend if you have a small space or are a single person or couple that doesn't cook for crowds. Was a bit bummed to see that this microwave stopped working after only a year. I'm used to the older styles that last forever, maybe this is just the way it is now? Worked great before it died. No complaints except for the longevity of the product. Day one of its use was fine, after setting clock and learning the controls and how it differed from my old unit. The interior light flickered a bit before it stayed on during use. Day two reheating the morning coffee the this unit shut off.....NO power!? No clock, keypad, nothing. I obviously had power at the outlet. I unplugged the oven and plugged it back in, still no power. With it plugged in I grabbed and wiggled the cord at the oven. It came back to life. After resetting the clock I tried the oven again and worked fine. I'm not concerned about any danger with this unit because I couldn't duplicate the problem. Overall I'm happy with this oven, especially for the price paid. The only criticism I have is: either the interior light is Not bright enough, or the dark shading on the glass door is too dark. It is difficult to see whats cooking. 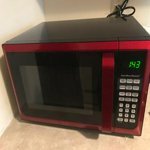 I purchased this microwave to replace a 700 watt microwave that stopped working after a storm. First thing I noticed was the turntable. It turns rather slow compared to other microwaves. Second thing I noticed is that some things don't cook as thoroughly as my previous microwave. I'm guessing it may be the slow turntable. We bought this microwave in february and we were happy with it at first. 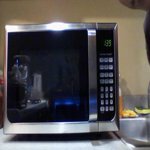 However, after just a few months, we noticed that it started sparking whenever we tried to microwave popcorn and a few other foods. 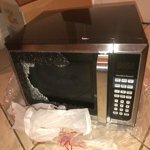 We made sure there was no metal on what we were putting in the microwave and kept it spotless, but continued to have this issue. We already bought a new microwave, but getting refund for this one has also been quite a headache. Would not recommend. Does this have a turntable? 4. 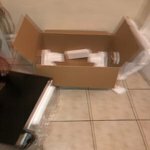 The one that I received had just the microwave box. 3. yes it is in a shipping box. 1. Thank you for your question. 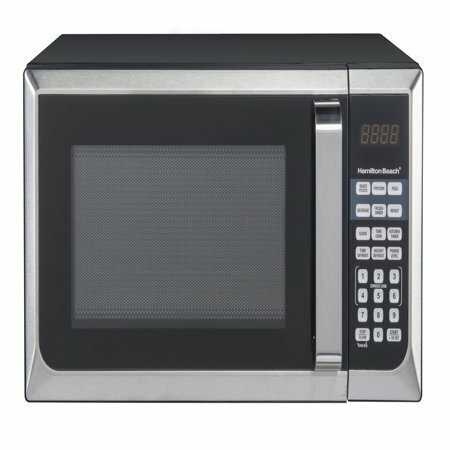 In order to receive assistance for your microwave, you will need to contact 1-855-313-1612. We apologize for any inconvenience. 2. Not really tall. I measured it at about 8&quot;. No taller than 8 1/2&quot;. Sorry I can&#39;t be more accurate - I only have a 6&quot; ruler. 3. Height is 8&quot;. I only had a 7&quot; ruler to measure with but it is no taller than 8 1/2&quot; maximum measuring from the center of the turntable to the top of the interior.